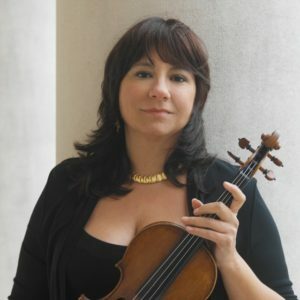 The 2018 Berkeley Festival was a milestone—the first time a major early music festival made a strong case for applying the principles and practices of historical performance to music of the 19th century, up to and including Debussy, as demonstrated in a program by Alexei Lubimov co-presented by the Westfield Center. 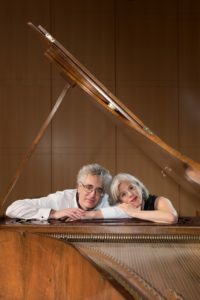 In an early piano competition, historical keyboard specialists, performing on replicas of instruments from the 1790s through the 1830s, played works of Beethoven and Chopin. 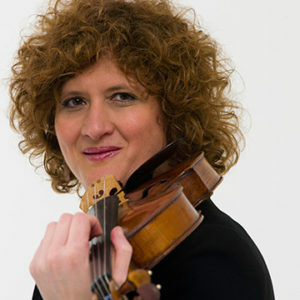 Musicologist Kate Van Orden explained in her lecture that the arguments for applying our historical knowledge and using historical instruments for music of the Romantic eras are no less compelling than they were for applying such insights to music of the baroque era, half a century ago, when that first was done. The centerpiece of this forward movement was Saturday night’s concert by Musicians from the Valley of the Moon Festival with tenor Nicholas Phan. Their program of Schubert and Schumann chamber music and Lied was a revelation in many ways. Both the broader palette of the fortepiano’s colors and its softer dynamic restored a balance in this music which often can be lost with the use of a modern piano. 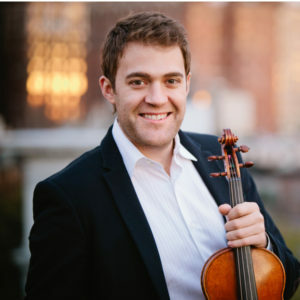 On March 16, Musicians from the Valley of the Moon Music Festival will return a riveting look at one of the greatest and most iconic composers of the late Romantic era, Johannes Brahms. This fresh portrait of the composer will be from three different angles—from the highly refined and exquisite Horn Trio written for natural horn, to the sublime songs for contralto, viola and piano, to the winning and show-stopping Piano Quartet in G Minor. The group will perform on historical instruments, including an original Viennese fortepiano from 1841. This performance affords audiences an extremely rare opportunity to hear the transparency of Brahms’ contrapuntal lines come through clearly and beautifully, in a performance featuring some of the country’s leading chamber musicians: Emily Marvosh, contralto; Sadie Glass, natural horn; Owen Dalby and Bettina Mussumeli, violins; Jodi Levitz, viola; Tanya Tomkins, cello; and Eric Zivian, fortepiano. It will be a special, single performance taking place at Berkeley’s St. John’s Presbyterian Church. Ross Armstrong contributed the following notes on the works the Valley of the Moon Musicians will perform. Johannes Brahms (1833-1897) Two Songs for contralto, viola, and piano, Op. 91 (1884) In addition to a large body of choral music, Brahms composed nearly 200 songs for solo voice and piano. These included some of his earliest pieces, written before he was 20 years old, as well as his final work, the “Four Serious Songs” composed in May 1896, just a month before he developed the first symptoms of the cancer from which he would die the following year. By 1884, the year of the two Opus 91 songs, the 51-year-old Brahms was generally recognized as the greatest living German composer. Wagner had died the previous year, Bruckner had not yet received the recognition he deserved, and the careers of Richard Strauss and Mahler had barely begun. Brahms, meanwhile, had recently completed his violin concerto, his second piano concerto, and the third of his four symphonies. His friend, the great conductor Hans von Bülow (1830-1894), had named Brahms one of the “Three B’s,” along with Bach and Beethoven. Brahms may have begun sketching the Two Songs as early as 1864. They lay incomplete and unpublished for nearly twenty years. Then, in the summer of 1883, Brahms met the 26-year-old German contralto Hermine Spies in the spa town of Wiesbaden. His infatuation with the singer inspired Brahms to compose or complete more than three dozen songs over the next three years, including the two published in December 1884 as Opus 91. Hermine Spies and Brahms continued to meet during summers until 1888, when they parted amicably. The Two Songs, Op. 91, are unique among Brahms’ output in including a solo part for viola along with the piano accompaniment. Brahms called the first song Gestillte Sehnsucht (Stilled Longing). The text is taken from an early poem, “In gold’nen Aberschein getauchet” (Steeped in an evening glow), by the German writer Friedrich Rückert (1788-1866). Many composers, including Schubert, Schumann, and Richard Strauss, set Rückert’s poems to music. He is probably best known for the texts to Mahler’s Rückert-Lieder (1901-02) and Kindertotenlieder (1901-04). Brahms’ Gestillte Sehnsucht was composed in D major, marked Adagio espressivo. There are three verses. The first describes the solemnity of a forest during a golden evening, as the wind and the birds whisper the world into slumber. The second verse descends into D minor as the poet asks when his yearning desires will also be stilled and fall asleep. In the final verse, once again in D major, the poet answers his own question, realizing that when he no longer dreams, and when his gaze does not rest upon the stars, the wind and the birds will whisper away his longing, along with his life. The second song, Geistliches Wiegenlied (Sacred Lullaby), uses a text, “Die ihr schwebet” (You who hover), written by the Spanish poet Lope de Vega, translated into German by Emanuel Geibel (1815-1884). Here the viola plays a separate tune based on an old German cradle hymn, Josef, lieber Josef mein (Joseph, my dear Joseph). Max Reger later used the same hymn tune in his famous Mariä Wiegenlied (Virgin’s Slumber Song), published in 1912, and now frequently heard at Christmas. Brahms’ song is in five sections. The first two are in F major, with a tempo of 6/8 Andante con moto. The singer asks the angels to silence the wind in the treetops, and then directly addresses the palm trees, requesting them to be silent. The third section changes the meter to 3/4 and the key to F minor as the singer describes the discomfort endured by the tiny child. The fourth and fifth sections return to 6/8 and F major, repeating the music of the first two sections, while the words describe the sleeping child, covered and protected from the fierce cold. Horn Trio in E-flat major, Op. 40 (1865) Brahms’ Trio for piano, violin, and horn, written to commemorate the recent death of his mother, was one of the most personally meaningful works he ever composed. When he wrote the Horn Trio in 1865 at age 32, he was not yet well known as a composer. His only orchestral works to date had been his first Piano Concerto, which initially had not been well received, and his two early Serenades for small orchestra. Otherwise he was known within musical circles mainly as a composer of piano pieces, songs, short choral works, and a small amount of chamber music. More widespread recognition would only come a few years later with performances of the German Requiem, widely recognized by the public as a masterpiece. The Horn Trio and the Requiem were both inspired by Brahms’ grief over the death of his mother. In many ways, the Horn Trio closes the first chapter of his career as a composer. Brahms’ parents were married in 1830. At the time his father was just 24 years old, while his mother was already 41. The marriage was initially a successful one, and within five years the couple had three children. Their son Johannes was born in 1833. Brahms received his first music lessons from his father, learning among other things how to play the natural (valveless) horn. By age 15, Brahms was already giving solo piano recitals. He first became known outside Hamburg when he was asked in 1853 to accompany the great Hungarian violinist Eduard Reményi on a concert tour of Germany. Following the tour Brahms returned to Hamburg, where he remained for several more years. He eventually left Hamburg in 1862 for Vienna, then considered to be the musical capital of Europe. In Vienna he gave concerts of some of his chamber music, temporarily found employment as a choral director, and started to give piano lessons. But in 1864 he had to return to Hamburg where the marriage of his parents was threatening to break up, partly due to the great difference in their ages. His parents did separate that year despite Brahms’ efforts. Then at the end of January 1865, his mother died at age 75. Brahms was devastated. Brahms spent the summer of 1865 in Baden-Baden, near the Black Forest, and in Lichtenthal just outside Baden. There he began his Horn Trio. He claimed that the idea to write a work for the horn, an instrument long associated with woodlands and the hunt, came to him during a walk in the forests surrounding Lichtenthal. Brahms’ childhood memories of his lessons on the horn and his desire to write a work that would honor his parents also led him to want to write a work using the horn. 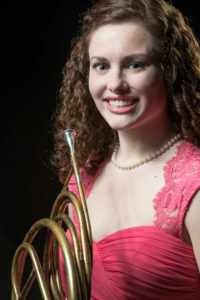 Brahms specified that the horn part should be played on a “Waldhorn,” a natural horn without valves, even though the more modern valve horn had been replacing the old valveless instrument in European orchestras since at least 1835. 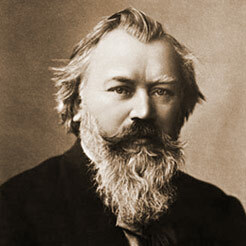 Brahms stipulated that if the part could not be performed on the natural horn, a cello should be substituted. The Trio was eventually published in November 1866 for “Pianoforte, Violin, and Waldhorn (or Violoncello).” But even in Brahms’ time, it became customary to perform the Trio using a valved horn, since this significantly lessened the technical demands for the horn player. Brahms made reference in the Horn Trio to his grief over the death of his mother by quoting the song Dort in den Weiden steht ein Haus (There in the meadow stands a house). The song, supposedly a folk tune from the lower Rhine region, had been published in a collection of German folk songs in 1838-40. For Brahms the song recalled his youth in his parents’ home. Brahms completed the Trio in July 1865. It was first performed in Zurich on 28 November 1865, with Brahms at the piano. The official premiere took place in Karlsruhe, just north of Baden, on 7 December 1865. Brahms once again played the piano part. The Trio, in the “horn friendly” key of E-flat major, is in four movements. The first movement establishes the serious and thoughtful nature of the entire piece. For the first and only time in his chamber music works, Brahms wrote an opening movement that was not in traditional sonata form. Rather it is a sort of rondo, with alternating A and B sections. The opening A section is a 2/4 Andante in E-flat major. This is followed by a more restless B section, whose time signature changes to 9/8 and whose key changes to G minor. Abbreviated A and B sections follow, in E-flat major and then B-flat minor. The movement ends with another A section, modulating from G-flat major back to the home key of E-flat major. The second movement is a lively Scherzo, containing a more solemn middle Trio section. Having chosen not to use sonata form in the first movement, Brahms constructed the Scherzo section as if it were a typical sonata movement. There is an exposition, modulating from E-flat to B-flat major, followed by a development section, and then a recapitulation of the exposition, this time remaining in E-flat major throughout. The middle Trio section is marked to be played much more slowly (Molto meno Allegro, literally “much less fast”) than the Scherzo. Brahms wrote the Trio in the dark key of A-flat minor. It is followed by a repeat of the Scherzo, da capo (“from the top”). The third movement, to which Brahms gave the unusual tempo marking of Adagio mesto (mesto being the Italian word for “sad”), is one of the most heartfelt pieces ever written by Brahms. Like the first movement, it is composed of alternating A and B sections, although here they are not so sharply delineated. Most of the movement is in another dark key, E-flat minor. About two thirds of the way through the movement, first the horn and then the violin quote the opening measures of the German folk song. The desolate nature of this movement reflects the intense grief Brahms experienced following the death of his mother earlier in the year. The final movement is written in “hunting horn style.” It also makes use of the German folk song. While the first movement was rather surprisingly written in rondo rather than sonata form, this last movement, which typically would have been a rondo, is written in strict sonata style. There is an exposition, with a first theme in E-flat major and a second theme in B-flat major. The entire exposition is then repeated. This is followed by a rather short development section, and then a recapitulation of the exposition, this time with both themes in E-flat major. A brief coda brings the Horn Trio to an emphatic close. Piano Quartet No. 1 in G minor, Op. 25 Brahms’ first Piano Quartet was one of his earliest pieces of chamber music. Conceived as early as 1857, it was drafted in 1859 and completed in 1861 while the composer was still living in Hamburg, before his move to Vienna the following year. In 1853 the young talented pianist Brahms had been invited by the Hungarian violinist Reményi to accompany him on a tour of Germany. Brahms interrupted that tour in September in order to meet Robert and Clara Schumann. Robert was impressed with Brahms’ talent, while the 20-year-old Brahms developed a romantic attachment to the 34-year-old Clara, a famous pianist in her own right. At the same time, Clara was also caring for a large family, including six children under the age of 12. Tragedy struck the Schumanns the following year when Robert had to be committed to an asylum, due to neurological damage and mental instability from the syphilis he had acquired more than twenty years earlier. After Robert died in 1856, Brahms declared his love for Clara. She for her part wisely declined Brahms’ offer, and moved in with her mother. Following this episode, Brahms and Clara Schumann remained close friends for the next 40 years, each respectful of the other’s talents. The influence of both the Hungarian Reményi and the Schumanns can be heard in Brahms’ first Piano Quartet. Brahms was only 28 years old when he completed the G minor Piano Quartet in 1861. At the time, his reputation as a composer was confined to Hamburg and to a small circle of musicians elsewhere in Germany. After completing the Piano Quartet, he arranged to have it performed in Hamburg on 16 November 1861. On that occasion he was fortunate to have Clara Schumann performing the piano part. Brahms rapidly composed a second Piano Quartet in A major. Then when he moved to Vienna in 1862, both of these quartets helped to introduce him to the Viennese public. The first Piano Quartet was performed in Vienna on 16 November 1862, with Brahms at the piano, and the second received its premiere in Vienna on 29 November 1862. Both quartets were later published in June 1863, the first with a dedication to Baron Reinhard von Dalwigk, a Hessian statesman and a patron of Brahms’ friend, the composer Albert Dietrich. The G minor Piano Quartet is in four movements. The first, marked Allegro, is an expansive sonata movement, with a lengthy exposition, modulating at first as expected from G minor to B-flat major. The second theme, however, is set firmly in D major. Due to the inordinate length of the exposition, it is not repeated, although the development section begins with a restatement of the first theme, initially giving the listener the impression that the exposition is going to be repeated. When the recapitulation is finally reached, Brahms omits the first parts of both the first and the second themes. The section formerly in B-flat major is now heard in G major, while the D major second theme begins in E-flat major before finally returning to the home key of G minor. There follows an extended coda in G minor. Brahms called the second movement an Intermezzo. It functions as the scherzo of the quartet, and is in fact composed of an opening section (the Intermezzo), a Trio, and then a repeat of the opening section, just as if it were a scherzo. The Intermezzo section is written in 9/8, marked Allegro ma non troppo. It begins in C minor, but rapidly modulates to C major and then concludes in C major. The shorter Trio, marked Animato, begins in A-flat major, but then modulates through a wide variety of keys before returning to C minor. The Intermezzo section is then repeated note for note, although unusually Brahms wrote it out in full. It is followed by a brief coda in C major. The third movement, a gentle 3/4 Andante con moto, in E-flat major, is in ternary (ABA’) form. The opening A section begins in E-flat major, but eventually modulates to C minor/major. The martial middle B section, marked Animato, begins in C major, visits C minor, and then wends its way back to E-flat major. The final A’ section and the Coda remain in E-flat major. Brahms called the final movement Rondo alla Zingarese, or “Gypsy Rondo.” Haydn had called the final movement of his “Gypsy Rondo” Piano Trio (1795) a Rondo all’Ongarese, literally a “Hungarian Rondo.” Neither Haydn nor Brahms recognized that the Hungarian Gypsy music with which they were familiar did not represent the music of the Hungarian Magyars. Regardless, this “Gypsy Rondo” is an exciting piece of music, popular ever since it was first heard in Hamburg and Vienna. It has the reputation of being one of Brahms’ most difficult pieces of chamber music to perform. Marked Presto, it is constructed of multiple contrasting themes, which can be grouped into three major sections. The first section of the Rondo includes the opening theme (A) in G minor, followed by a second theme (B) in B-flat major, and then a varied repeat of the opening (A) theme, again in G minor. The middle section includes four themes (C, D, variation of B, and variation of C). All are marked to be played Meno Presto (less fast), and all are in G major, except the D theme, which drops into E minor. The final section of the Rondo begins with another variation of the opening (A) theme, once again marked Presto, and back in G minor. This time the theme concludes with a brief cadenza for the pianist. This is followed by a “development” section, where variants of the D, B, and C themes are combined. Finally, there is yet another variation of the opening (A) theme, again in G minor, but this time marked Molto presto. It makes for a thrilling conclusion to the Quartet. You will have only one opportunity to hear this special concert, Saturday, March 16, at 7:30 p.m., in St. John’s Presbyterian Church, 2727 College Ave at Garber, Berkeley. Tickets are available online, through the SFEMS box office at 510-528-1725, or at the door 45 minutes before the performance.